"I had an energy drink before playing. I've never done that before. I'm wired," said Best Fern's Alexia Avina. You couldn't tell. 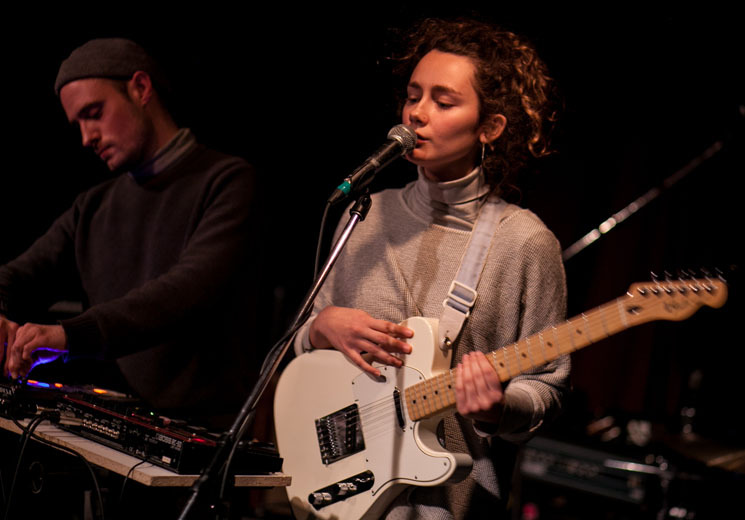 The duo — vocalist/guitarist Avina and producer Nick Schofield — crafted a set of intimate, ambient electronic that was relaxing and meditative even at its loudest. Performing the five tracks from their debut EP, the duo slowly eased from ambient soundscapes to spacier, more electronic territory. Avina's lyrics, often repeated and looped into choral harmonies, were simple, confident paeans, elevated by Schofield's minimalist electronic production. During EP closer "I Will Try," Avina held up a walkie-talkie and looped the feedback, adding an unsettling crackle to the mix, further heightening the mood simply and effectively. They paid tribute to another Montreal minimalist electronic duo, the now-defunct Majical Cloudz, with a cover of "Bugs Don't Buzz." Best Fern infused their own stylings into the work, with Schofield incorporating icy synths and walkie-talkie chatter, and Avina vocalizing in her upper register. There are plenty of similarities between Majical Cloudz and Best Fern, but the latter's rendition allowed them to emphasize their differences and flex their muscles. Even with minimal setup and output, Best Fern have already learned to embrace their strengths and internal chemistry, both filling a void in Montreal while putting their own spin on it.